Yosemite Falls...and how they were formed. Yosemite Falls is undoubtedly the most famous of all of the magnificent waterfalls that you will find in Yosemite National Park. Nowhere else in the world will you find so many beautiful and varied waterfalls as you do in Yosemite Valley in the springtime. Every sheer cliff puts on its own pageant of free-leaping white water, each seeming to try to outdo the other waterfalls as it plunges earthward. Late in the spring and into the early summer, snows melting up in the high country fill streams to the tops of their banks. When this happens, the water in Yosemite Falls thunders from the edge of the valley and more than 2,000 feet down, shaking the valley walls. But this "performance" lasts only as long as the snow that feeds Yosemite Creek does. 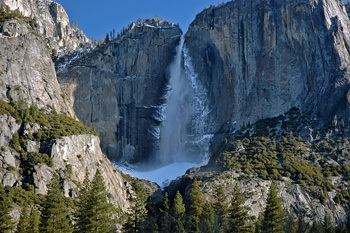 By late summer the snows have all melted away and the once booming Yosemite Falls becomes a trickle. It now leaves only a shadow of what it once was on the cliff wall. Autumn storms give Yosemite Falls a life once more, and cold winter temperatures freeze the spray from the Upper Fall onto the cliff where it begins to resemble a great white Christmas tree. As morning suns begin to warm the granite cliffs, the ice loosens and falls away forming a frozen cone at its base. In some especially cold winters the cone reaches heights of more than 300 feet, but it all gradually melts away as warm spring days start the waterfall cycle all over again. 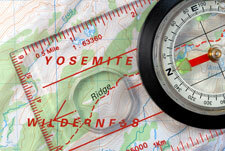 The total height of Yosemite Falls is 2,425 feet and is divided into three parts. The upper fall of 1,430 feet, then a middle cascade of 675 feet, and finally a lower fall of 320 feet. This is twice the height of Niagara Falls. 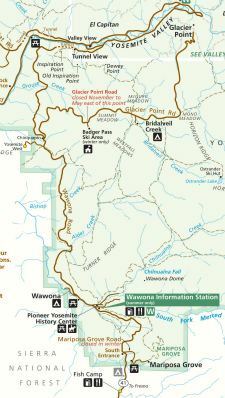 You may walk the short distance to the base of the lower fall, but if you have lots of energy, the 4 mile long trail to the top of the upper fall starts at Sunnyside Camp. Bridalveil Fall is one of Yosemite’s most beautiful. When summer breezes spray the water from Bridalveil across the face of the cliffs, it is easy to see why it was given its name. 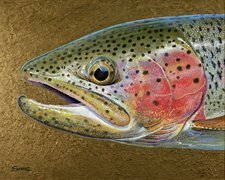 On special occasions when driving down from the Wawona tunnel in the mid-afternoon, if the sun is right, a beautiful rainbow is often formed across the fall. Everywhere you look in Yosemite there is “living geology”. As you look toward the top of Bridalveil Falls keep in mind that Bridalveil Creek, (which feeds the falls), and the Merced River once ran at the same level.Over the years the “Merced” has roared down the face of the Sierra Nevada. In contrast, Bridalveil Creek has flowed over its flatter rock surfaces much more slowly. 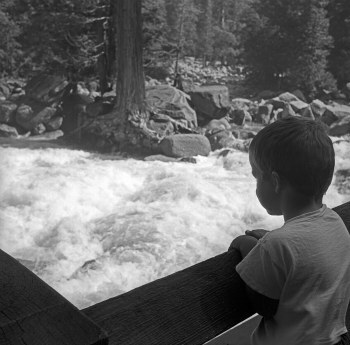 Bridalveil Creek was simply unable to keep pace with the cutting action of the Merced River. How far it was left behind is shown exactly, by its 620 foot drop from its lip to the floor valley below. 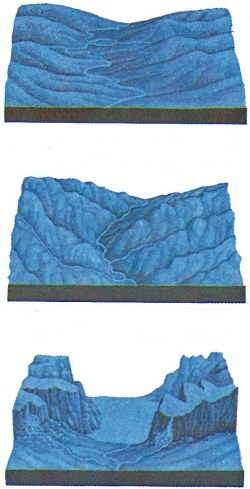 Prior to the uplift of the Sierra Nevada, streams were on the same level. The free-leaping falls like Yosemite falls, Bridalveil falls and Ribbon falls, drop from “hanging valleys” formed when lateral tributaries could not keep pace with the combination of the rapid cutting of the Merced River and the grinding force of the glaciers. As the river cut faster, the side streams formed gulches to it. The Merced River forms the Vernal and Nevada Falls where great blocks of granite were first quarried and then carried away by the glaciers. These giant steps are located at the east end of the valley. After the ice age, the waterfalls now fell from Hanging valleys. Cascading waterfalls such as Sentinel, Royal Arch Cascade and the spectacular Staircase Falls splash in successive rock “steps” down the sloping sides of the valley walls. Their waters are always considerably diminished by mid-season. Yosemite's waterfalls change with the seasons. Many are fed by the waters from melting snows, but a summer thundershower may bring forth hundreds of falls that leap from valley walls only to live briefly and then disappear. 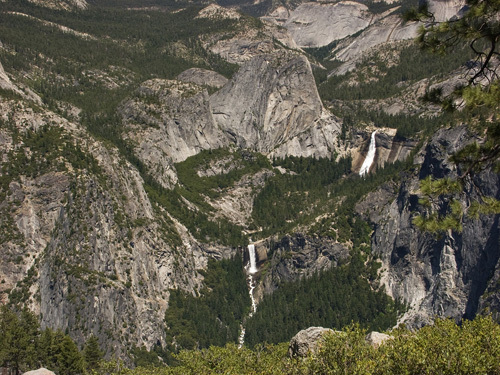 Almost all of the waterfalls of Yosemite Valley become dry before the end of summer. 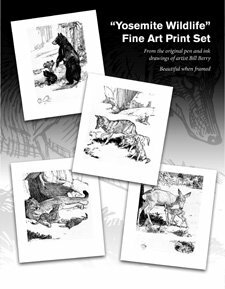 The reason for this is that they are fed by water from the snowfields above, and as the snow melts, it is in a terrain that is so rocky that very little of the water soaks in. Once the snow is gone so is the water. Fortunately, there are several exceptions to this rule for the "late summer" visitor to enjoy. Bridalveil fall always has some water; Illiouette Fall which is further up the Merced Canyon is another that flows year ‘round. 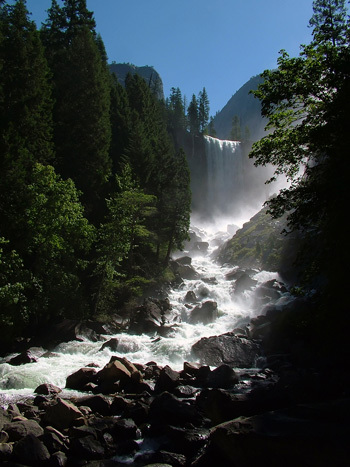 Two other waterfalls which can always be depended upon are Vernal and Nevada falls. 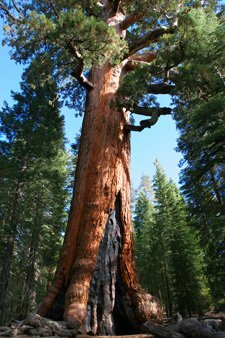 These two have been formed by the plunging Merced River. 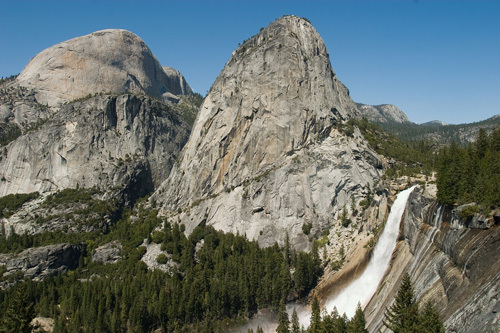 The two huge granite steps over which Vernal Fall and Nevada Fall drop, is referred to as the Giant’s Stairway. 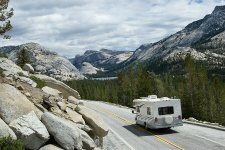 These great blocks of rock were quarried by the Merced glaciers as they ground slowly down into Yosemite Valley. There are several ways to enjoy these two waterfalls on foot or from your car. 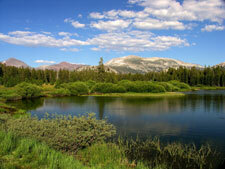 They can both be seen together from the location of Washburn point which is near glacier point. 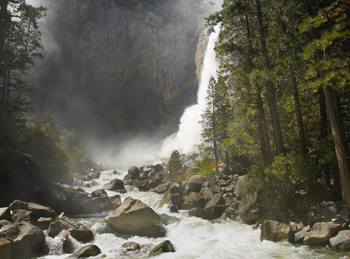 Vernal Fall is a very wide water fall of more than 70 feet across at its lip when the river is at its fullest. 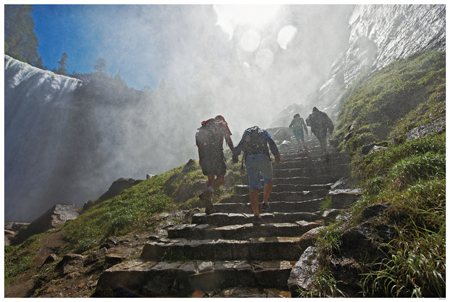 When it strikes the pool and rocks at its base, curtains of water bathe the canyon below in a cloud of filmy spray that covers the hikers on the aptly named Mist Trail. 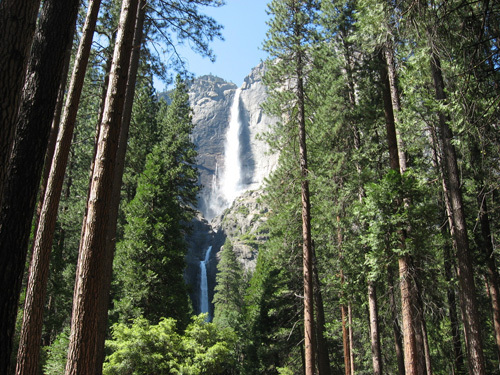 Vernal Falls was named in 1851 by Dr. Lafayette Bunnell, the surgeon with the Mariposa Battalion, and drops from a height of 317 feet. Its luxuriant foliage which is kept moist by the spray from the fall, probably inspired the name. Immediately up-river from Vernal Fall is Nevada Fall. Though not nearly as wide as Vernal is, Nevada is almost twice the height at 594 feet. The hike up the Merced Canyon from Happy Isles to see these falls is especially rewarding. 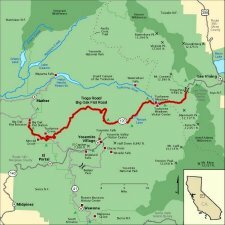 The Merced River puts on a beautiful show of its cascading waters as they race from Little Yosemite to Yosemite Valley…a drop of about 2000 feet in less than 2 miles. The trail provides a series of spectacular scenic views. Unless you come to visit Yosemite National Park in the spring or early summer, you won't see water coming over Yosemite's highest single fall. 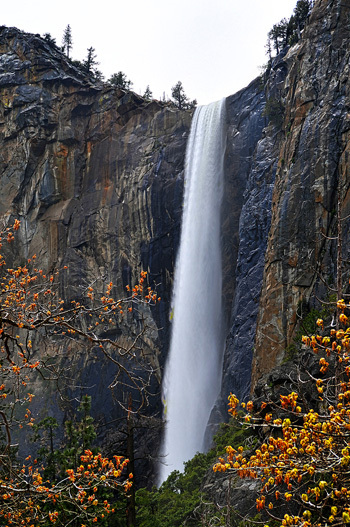 Ribbon fall flows for only a short time from its location just west of El Capitan where it free-falls for 1,612 feet! For several weeks in the early part of the year, one of the "ghost" Yosemite waterfalls will sometimes appear, as it has throughout the geological history of Yosemite Valley. 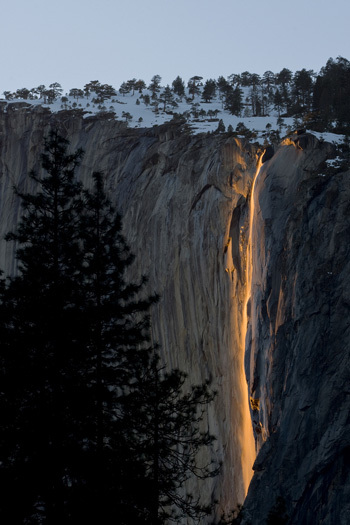 Recently re-discovered on the internet after having been photographed being struck by the setting sun, the waterfall known as Horsetail Falls has become popular as the "new" Yosemite Firefall. 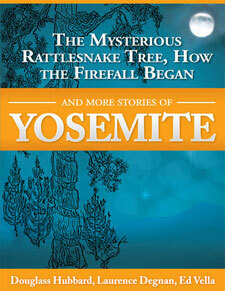 More about this story along with other fun and fanciful tales from Old Yosemite can be found at "The Mysterious Rattlesnake Tree, How The Firefall Began And More Stories of Yosemite". “After the first several warm days of the year, the High Country snow fields began their ‘melt’. 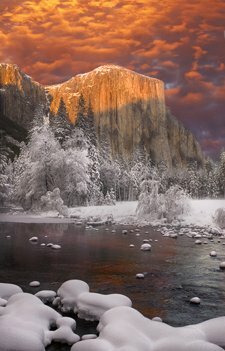 What had been a quiet winter with the flow of water from Yosemite Falls minimized by the frigid temperatures was now officially over.Whether the rest of the valley had awakened to the new Spring or not, Yosemite Falls signaled the arrival with its’ inescapable booming presence. Our house in Yosemite was a short ten minute walk from the bottom of Yosemite Falls. Each year I looked forward to walking up with my Dad to see what the new waters had turned Yosemite Creek into. 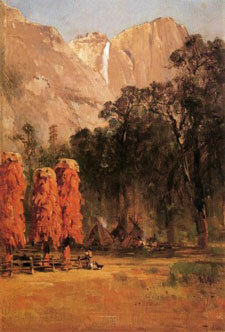 To return to the Home Page from Yosemite Falls please click here. 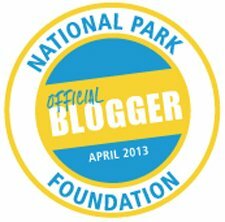 Building Today's Tioga Road Was A Gargantuan Task!